The second type of early photographs were ambrotype photos. Ambrotypes look very similar to the later tintype photos. An easy way to test them is to use a magnet – even through the case you can fell the attraction of the magnet with the iron used for the tintype. The glass of the ambrotype feels no pull from the magnet. An ambrotype was created on a piece of glass – and looked like a negative until a black background was added. Begun about 1855, the earlier ambrotypes had the photograph on one piece of glass, with an additional piece of glass covered with a tar-like pitch. 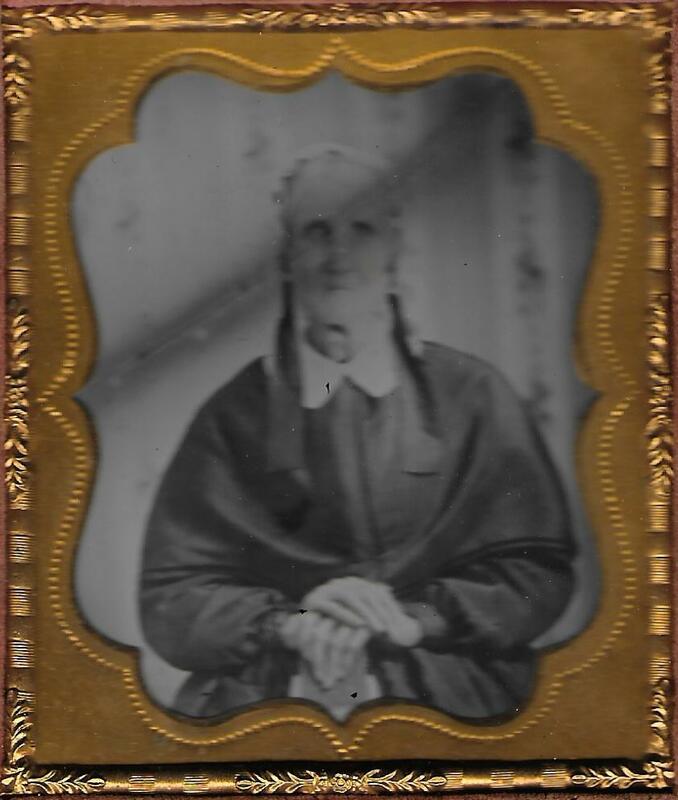 About 1858 the varnish covers the back of the glass with the photo on front or sometimes a colored class was used. 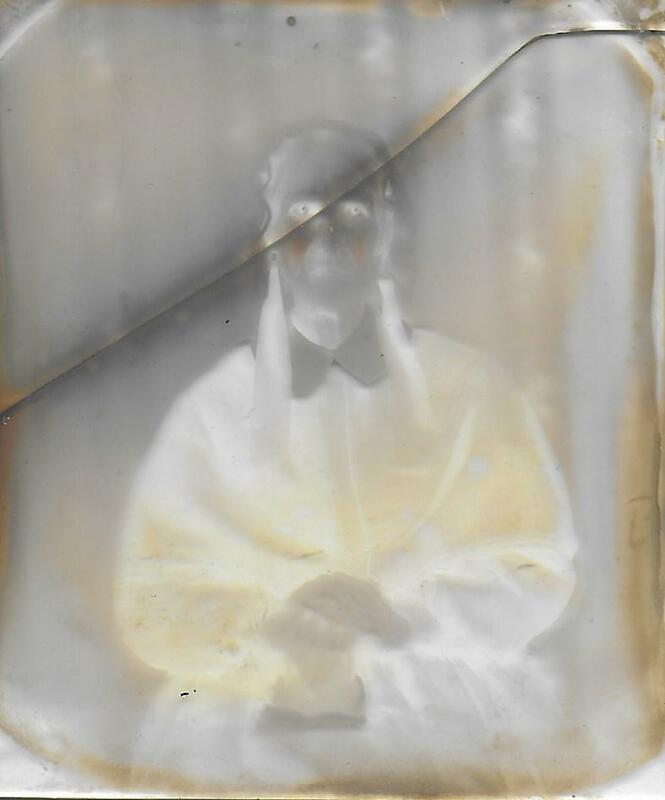 In 1859 the clear glass has a black cloth at the back of the image. I have one with the double glass and one with the black varnish on back of the photo. 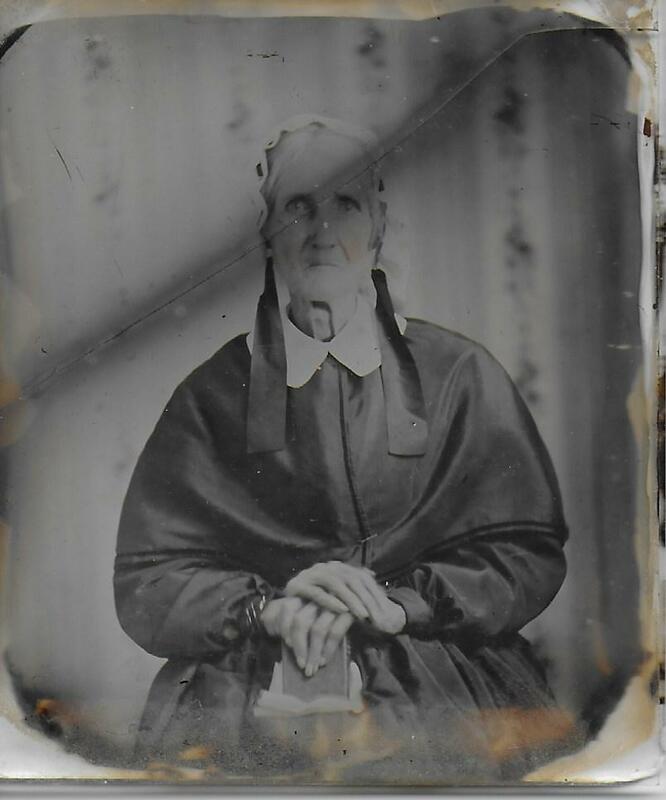 This photograph of my 4th great-grandmother, Nancy Linton Edwards, was probably taken about 1855. There are two pieces of glass in the case – one with the photo, and another with the black pitch on back. Unfortunately, the glass containing the photograph was broken, but it still gives us a good idea of her features. Nancy was the daughter of Captain John Linton and Ann Mason, born in Loudoun County, Virginia, in 1778. She married Edward Barber Edwards, with whom she raised a large family. On the way through the Cumberland Gap, from Virginia to Kentucky, her horse was spooked by a cougar or bobcat, causing her to fall and break her leg. She traveled in a litter the rest of the way to Washington County, and never walked again. Nancy’s cotton cap was used by older women during the 1850’s, younger women using a bonnet. She wears the older fashions of the 1840’s. Looking at her white hair, face and neck you could easily guess her age of about 77. But look at her fingers – they look long and very elegant. There is just a hint of color in her cheeks. As you can tell from this photo, the scan is not generally good unless you remove the photograph from the case, but I wanted you to see the mat that is used with this photograph. It is called a nonpareil mat, due to the shape, and was used between 1850 and 1859. The preserver (around the edge) is still rather simple, but a little more decorative than with the daguerreotype photos. 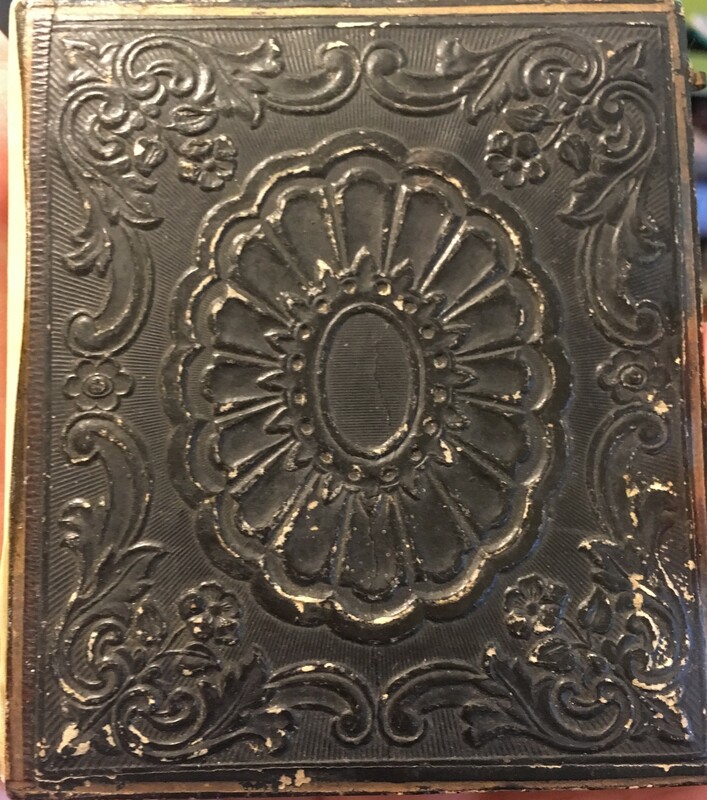 The case is lined with red velvet and is decorated on front and back with the same design. The case is 3 ¼ x 3 ¾. 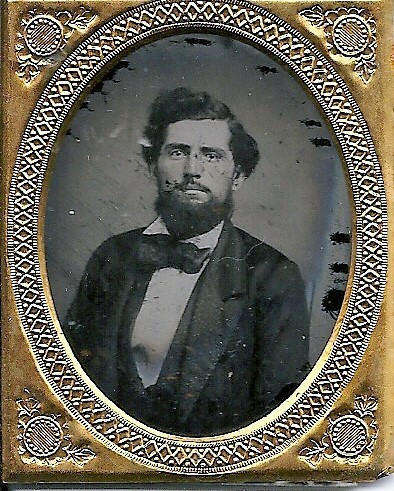 This next ambrotype is a great photo of a youngish man with great hair and beard! His collar and tie are from the 1850’s – as are the wide lapels of his coat and the overall larger look of the suit. I believe this to be Edward Edwards Taylor, son of John Compton Taylor and Susan Clark Edwards, my 3rd great-grandparents. Edward was a brother to my Catherine Elizabeth Taylor who married Edward Edwards Linton – a little confusing with those middle names! 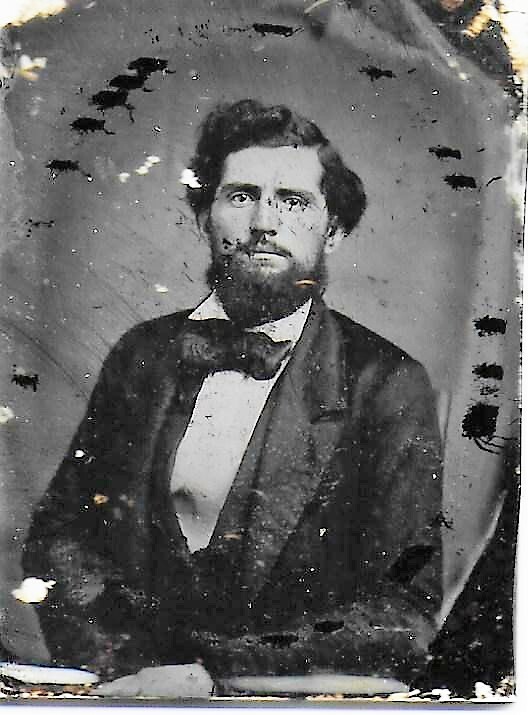 This photo has only one piece of glass, with the varnish on back, so we can date this photo to about 1858. In that year Edward, or ‘Ned’ as he was called, would have been 27 years of age. Also, his ears look very much like those of his father, John Taylor. The mat with this photo is oval, with much decoration. The preserver, not shown in this photo, is also more decorated, with semi-reinforced corners. The case is similar to Nancy Edwards’ case, but the photograph is smaller – 2 3/8 x 2 7/8. Daguerreotype, Ambrotype and Tintype – What Kind of Photograph Do You Have?